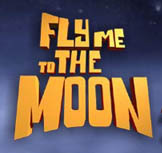 Fly me to the Moon is a delightful 3D computer generated movie for children of all ages (including adults) that takes place during 1969 with man's first attempt to walk on the surface of the moon. The main characters in the movie revolve three young flies, Nat (Trevor Gagnon), IQ (Philip Daniel Bolden) and Scooter (David Gore) who are quite cute in their appearance and have many human-like qualities and emotions. For Nat, the dreamer of the trio, he has had a dream of walking on the moon since hearing his grandfathers (Christopher Lloyd) tales of flying with Amelia Earhart over the pacific. Fortunately for Nat, he lives near Cape Canaveral and is planning to tag along with man to be the first fly to walk on the moon. With assistance from IQ, they create three moon suits and on one calm and dark night, they sneak out of home to stow aboard Apollo 11. When Mrs McFly (Kelly Ripa) wakes the next morning, her two close friends arrive at their home asking for the whereabouts of their two sons, only to discover by one of Mrs McFly's maggots that they snuck aboard the Apollo 11 rocket. From their the action begins for our three flies as Nat's grandfather attempts to calm his daughter for her son's dangerous mission. Although the star of the movie is the 3D animation itself which is quite brilliant, the movie contains a healthy dose of comedy and action to draw viewers in. Scooter, the tubby little fly is definitely my favourite character in the movie due to his overindulgence and great one-liners which brought a smile to everyone's face. Although based on a historical event, Fly Me to the Moon is a great family movie that is on par with movies such as Monster Inc and The Robinsons with its animation, story and humour which can be enjoyed by everyone. However seeing it on the giant IMAX screen is simply superb.